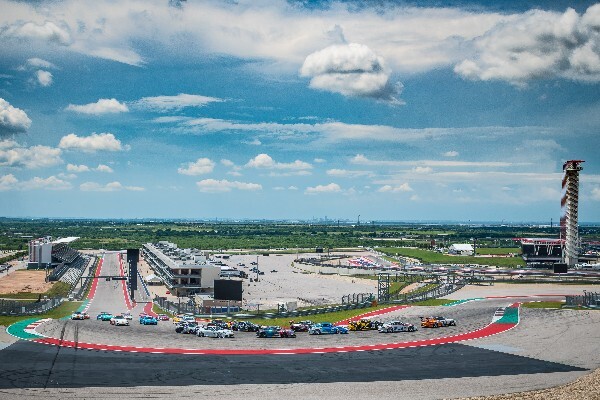 On a day of great racing on an iconic track, the Texas weather inserted itself into Saturday’s Pirelli Trophy West USA storyline, pouring rain in the middle of the GT4 race and forcing a delay to the start of the GT3 race at Circuit of the Americas. When the clouds cleared and the checkered flags flew, Kevin Woods had taken his seventh win of the season and Laura Ely had put the fourth victory notch on her belt for 2018. Twenty-nine Porsche GT3 and GT4 Cup cars in five different classes contested two races on the iconic 3.427-mile, 20-turn course at Circuit of the Americas: Diamond and Diamond Masters (2017-2018 991.2 GT3 Cup), Platinum (2015-16 991.1 GT3 Cup), Gold (2010-2013 997.2 GT3 Cup), Silver (Cayman Clubsport GT4 MR) and Bronze (2016 Cayman Clubsport GT4 Trophy) classes. After qualifying set the grid for both races, it was the GT4 runners that staged the opening race of the day. Ely, starting on the overall and bronze class pole for the GT4 race, pulled away at the start and gapped the field. Black Sheep Racing’s Ely was comfortably in the overall lead when the rain started to fall in Turn 11 18 minutes into the 35-minute race. Just a few minutes later, the Texas pop-up storm had covered the rest of the track. That brought out a full-course yellow and left the field, all on Pirelli P-Zero slicks, behind the pace car to come home to the checkered flag. Mike Vess started third overall and first in the Silver class, moving his NOLAsport Porsche Cayman around Paul Nemschoff in the opening corners and gapping his Silver class competitors for the win and overall GT4 second-place position. With the rain storm soaking the track, the GT3 race was delayed by one hour and 20 minutes to allow the track to dry. The decision to wait proved to be a good one, as the field was able to run the full 35 minute race on the Pirelli P-Zero slicks. Woods moved his TruSpeed AutoSport Porsche from the overall pole to the overall and Diamond class lead on the first lap and never looked back, including on a lap 11 restart that followed when then-Platinum class leader Sean McAlister spun into the gravel trap and caused a full-course caution. Preston Calvert took the Diamond Masters win after challenging Woods early in the race for the overall title. Calvert’s Competition Motorsports Porsche then went nose to tail with Alan Metni’s Kelly-Moss Road and Race machine for all 12 laps, with Metni finishing behind Loren Beggs for the overall podium. “It was a dogfight,” Calvert said. “It was a lot of fun. I got a pretty good start, so I got by Alan (Metni) at the start. I was able to run really close to the front runners for a while. I really kept my pace up as the tires came in. There were a couple of spots on the race track that were a little moist, but for the most part the grip was really good with the Pirellis. When McAlister spun off battling Beggs for the overall second-place, the battle for the Platinum win came down to Dave Elsner’s 911 Design Porsche and Gary Ferrera’s Pinnacle Motorsports ride. Elsner earned the victory through a two-lap sprint after the restart. The Pirelli Trophy West USA series will return to COTA for Race 2 on Sunday with the green flag set to fly on the GT3 race at 12:50 p.m. CDT, and the GT4 race at 1:40 p.m.